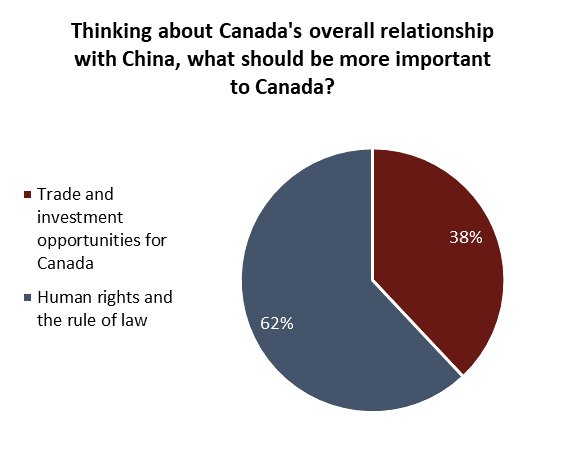 February 1, 2018 – Amid deteriorating diplomatic relations between Beijing and Ottawa triggered by the arrest of Huawei CFO Meng Wanzhou, public opinion reflects acute contradictions regarding Canada’s economic, social and political ties with China. A new survey from the Angus Reid Institute reveals that while a slight majority (52%) of Canadians say they’re dissatisfied with the way the Trudeau government has handled the situation, a slight majority (55%) also think their country was right to arrest Meng in the first place. And while most say China “can’t be trusted” on human rights, there is considerable disagreement as to whether the issue is any of this country’s business. Clearer narratives emerge among those who believe human rights and rule of law should be the most important aspect of the China-Canada relationship, and those who say trade and investment should be the priority. A plurality (44%) say they would like to see Prime Minister Justin Trudeau and his government take a tougher approach to the current conflict.